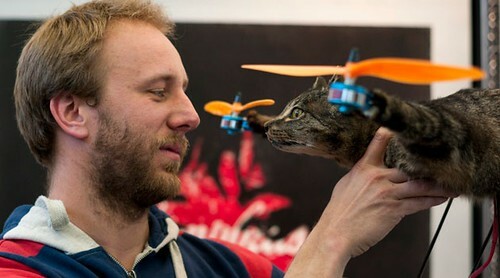 An artist (surely some wouldn't call him that) found a way to keep his dead pet longer by turning it into a remote-controlled helicopter. 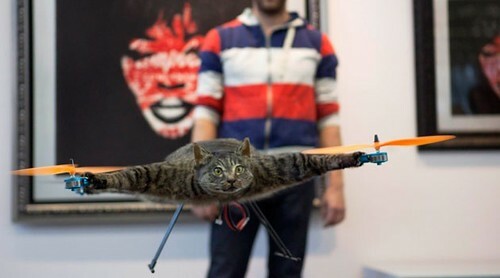 The cat, named Orville after the famed aviator Orville Wright (brother of Wilbur) died after being hit by a car last year and instead of burying it, owner Bart Jansen decided to stuff it, and make a helicopter out of it. So, what's next? Stuffing your loved ones and put them in a display cabinet to make them 'immortal'? Some people think this is funny and can't stop laughing. I don't. In some societies cats are not just pet, they are considered as pars/members of the family and are given proper burial. You don't have to treat them that way; a little respect will do. We don't have cat at home currently but I don't fancy having our future cat or our neighbour's being stuffed and turned into toys. That's not art! That's not cool! That's just pathetic!